With the largest assets base under management, HDFC mutual fund is not only the biggest mutual fund house but also the most consistent performer. Milind Barve was pulled out from HDFC Ltd - where he was in the treasury division - to join as Managing Director of HDFC Mutual Fund just four days after it came into existence in June 2000. Today, Barve is one of only two CEOs in India - the other is IDFC MF's Naval Bir Kumar - who remains head of a fund house since its inception. What satisfies the media-shy Barve even more is the experience of building India's largest-fund house from scratch. HDFC MF boasts the highest assets under management (AUM) of Rs 88,628 crore, with Reliance Mutual Fund closely following with Rs 82,305 crore. 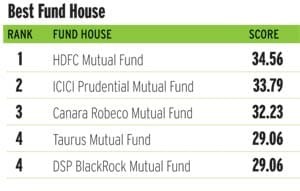 Apart from size, HDFC MF is also India's best fund house, according to the BT-Value Research Best Mutual Fund rankings. Displacing rivals like ICICI Prudential Mutual Fund and Canara Robeco Mutual Fund, HDFC MF's schemes, both in equity and debt, have consistently outperformed in the past five-year period (20 quarters). Stability at the top has certainly helped. "My team has also been around for a fairly long time," says Barve. "Our stable and high performing team puts us on a better footing," adds Anil Bamboli, a fund manager with HDFC. Bamboli, who has been adjudged the best debt fund manager in the BT-Value Research study, says the parentage of HDFC, the brand, its practices and investor focus have all contributed to HDFC MF's growth. On HDFC MF's investment approach, Barve says: "We would always like to be a no-surprise fund." For instance, HDFC MF launched just three schemes, including a gold fund, during the boom time of 2003 to 2008, while its rivals launched four to five schemes each year. "You have to keep your product simple," says Barve. "Our new products are driven by the investment team, not the marketing team." Ditto for due diligence while making investments in the market. Chirag Setalvad, who manages half a dozen HDFC schemes - one, HDFC Balanced, has topped the Hybrid: Conservative Growth category in this study - says that while valuing a company his team insists on meeting customers, suppliers, ex-employees, and carries out factory visits. "At the end, we try to stick to our circle of understanding, focus on the purchase price and a margin of safety," says Setalvad. "A bottom-up approach is the hallmark of HDFC MF," says Sanjeev Ahuja, a Delhi-based independent financial advisor and founder of SA Wealth Management. "They evaluate a stock and then decide to invest in it instead of buying stocks to chase a momentum." This strategy has worked for the fund house. For example, HDFC Prudence, a balanced fund, has given 25.34 per cent returns over the past three years, against 13.06 per cent by the CRISIL Balanced Fund Index. Two of HDFC MF's biggest schemes - HDFC Equity and HDFC Top 200 - have amassed AUMs of Rs 10,000 crore each. Early strategic moves have also helped. From 2000 to 2003, the debt dominated fund house attracted investor interest because interest rates were falling and the fund was holding high-yielding debt papers. In 2003, HDFC MF surprised everyone by buying an equity fund house, Zurich India Mutual Fund. It was a prescient move. Zurich came with high-performing equity schemes just when the equity market was getting into a bull run - the BSE Sensex zoomed from 3,000 levels in 2003 to 21,000 points in early 2008. "We also used the period of uncertainty post 2008 to consolidate our position by encouraging retail investors to make systematic investment plans," says Barve. A year ago, Barve took up chairmanship of Association of Mutual Funds of India. "The penetration of mutual funds is very low in India despite large AUMs of the industry," he says. "We all need to work on it." It is a new orbit for the head of India's best fund house.